The biggest reason most computers are slow is that they have not enough memory (RAM). I can upgrade your computer by adding more memory chips (see picture). This gives your computer more 'thinking space' allowing it to start up and perform much faster. 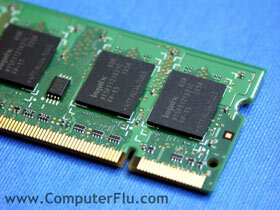 There are many types of memory for laptops and desktop PCs. I keep most types in stock. Traditionally computers have been sold with not enought Memory as the cost of memory can be quite high, but these days memory chips are one of the most cost effective things you can do to speed up your computer.